Official Ford Stereo Codes | Instant Online Decoding. Radio codes for you Ford stereo are available 24 hours a day 7 days a week. Our Ford V stereo codes are available instantly after purchase. We guarantee our stereo decodes work, that’s why we offer a 100% money back guarantee! 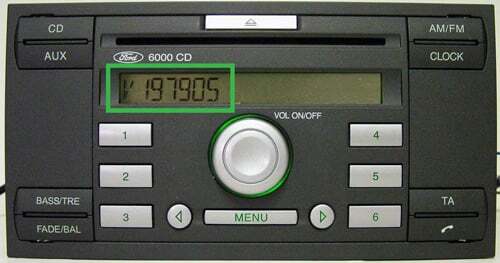 Showing your Ford stereo's serial code on the stereo's display. Turn on your stereo and hold the preset buttons 1 & 6 for 2 to 3 seconds, the code cycle will begin, wait until your serial shows and make note. It will look like the image below . If buttons 1 & 6 do not work, try holding button presets 2 & 6. The stereo serial will display on screen. The same method applies for this stereo. Holding buttons 1 & 6 together to start the code cycle. The 'V' serial will display towards the end of the cycle. How to Find Your Ford stereo Code Serial Number on the Label. It is quite simple to remove your Ford stereo. You will need a set of radio release keys (PC5-132). These are inexpensive and are around £3 - £5, you can obtain them from a local car audio shop or Halfords. Once you have the stereo release keys, push them into the 4 holes in each corner of the stereo (See image), apply a little pressure and the stereo will release from the dashboard. The radios label will be located on the stereo's casing. Step 2 - How To Find Your Ford stereo Serial. All Ford radio serial starts with V/M/BP/C7 for example V123456. The TravelPilot models are a longer serial number. An example of this would be C73F0961 C 0536857. Please see images below for reference. Rated 9.8/10 By Independent Review Site Trustpilot. Why Choose us to Decode your Ford Radio Code? We also offer a free Ford radio code lifetime code retrieval service, so if you ever lose your radio decode you don't need to worry! The decode we provide will always work for your radio.